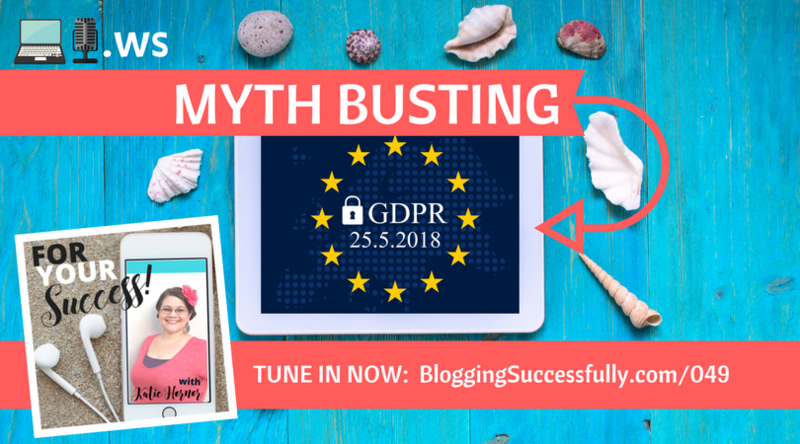 In this post I'll break down several of the myths floating around out there regarding GDPR and US-based bloggers need for compliance, and also show you the 5 simple steps to be sure you are compliant by the deadline, as well as you options if you choose not to comply. I am not a legal expert, and this course does not provide legal advice. I have a vested interest in your success under the GDPR, but if you need concrete legal counsel, talk to a lawyer. I strongly advise you to research GDPR on your own and consult with a certified legal professional in regards to your decision to comply or defy GDPR. Myth: This is coming out of no where, why the short notice? It been in the works since 2016, but no one really paid attention until a deadline looms and until recently we didn’t have clear expectations set forth. Myth: I am not an EU resident, I don’t have to comply. Is your site for EU residents or targeting them in any way? Can you identify traffic coming from EU countries? Do you have subscribers from EU countries? Do you have customers/clients from EU countries? Do you use google analytics? or third party data processors? Myth: This is about giving them my freebies without being allowed to follow up with offers. It’s about the right to give consent, rather than having assumed consent. It's good customer relationships really, and most companies who care about this are already probably mostly compliant. As far as your freebies and list opt-ins go, you will likely need clearer wording as to what you are going to deliver, and how often, but isn't that in the best interest of the relationship with all of your subscribers anyway? Myth: It is impossible to comply. Myth: If you don’t comply you’ll be fined 20m euros. The highest fine in UK currently is 500,000 pounds. The stated fine for non-compliance is 17m pounds or 4% of annual global profit, whichever is higher. The head of ICO herself has said that this is more of a shock value to reinforce how serious they are taking data protection, than something they plan to enforce left and right. No one is going to inspect your website come May 25 to see if you are compliant and come fine you if you’re not. They don’t have the staff in place to do that. Investigations can be initiated, but only upon receiving a substantial complaint. If someone complains about the way you handle their data, an investigation could be initiated and burden of proof is on you. Myth: They can’t fine me if I am not an EU resident. A: Well yes, technically they can. The ICO and the EU work closely with the Federal Trade Commission (FTC) on these matters. Myth: My email service provider is going to be compliant by May 25, I don’t need to do anything else. A: Not true, if someone complains about your list, YOU are liable, not the email service. You also have to have obvious and easy way to find policies on your site about the data you collect and process as well as how you allow users to opt out of cookies, and/or request to change, or delete information (erasure). 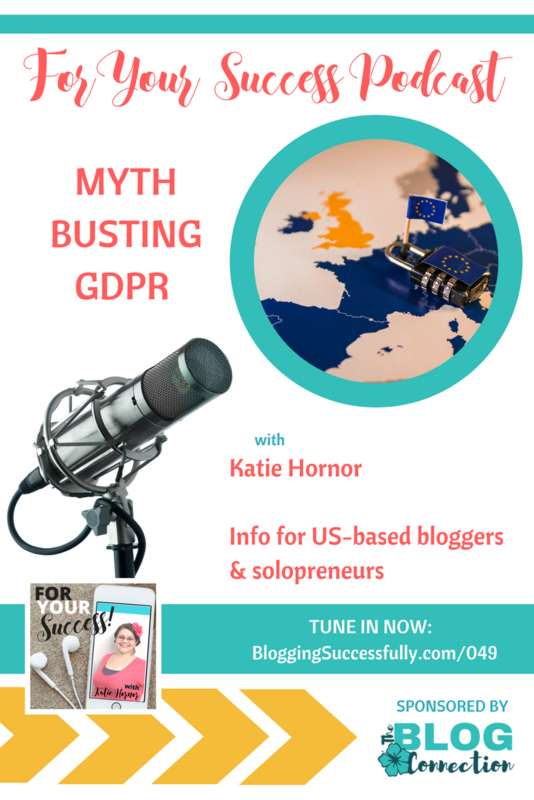 Data processing by third parties is only one part of the GDPR. Myth: This is so scary! A: Um no. It's not scary, and if when you calm down enough to focus on the facts, it's fairly straightforward. We are scared of the things we do not understand. If you take some time to investigate the sources and understand what is happening and what you must do to comply, you will be fine. In the last 10 years of blogging there have been tons of other changes and we've survived. Those who succeed ultimately are those who face challenges like this without letting it stop them. Using VPN they can still find you. Blocking entire countries of IP addresses with the htaccess or a plugin will slow down your site as it has to verify the IP address against the blocked list before serving the page or the error page. Blocking can be expensive: Cloudflare will do this but it requires the most expensive package, over $200/mo. Blocking countries at the server level is optimum, but only certain hosts do this. Black Chicken and WPengine will. Momwebs will if you have a dedicated server which is an extra $50/mo fee. The very act of blocking their IP is processing their location data to make a decision that affects their right to information. From what I understand the US doesn't currently consider location/IP address as personal data, but the EU does. EU based business owners are legally not allowed to block countries. As of now, US businesses can, but we may not always be allowed to. 3. Get compliant by May 25. Research, read, learn, make an effort to comply. Ultimately you have to make the best decision you can for your business. Comply or Not. How will it affect you and your people and your bottom line going forward? I can't answer that for you. Here is a 6-step compliance checklist. You're moments away from receiving the FREE GDPR compliance checklist by email. Just tell us where to send it! Success! Your checklist will arrive by email. 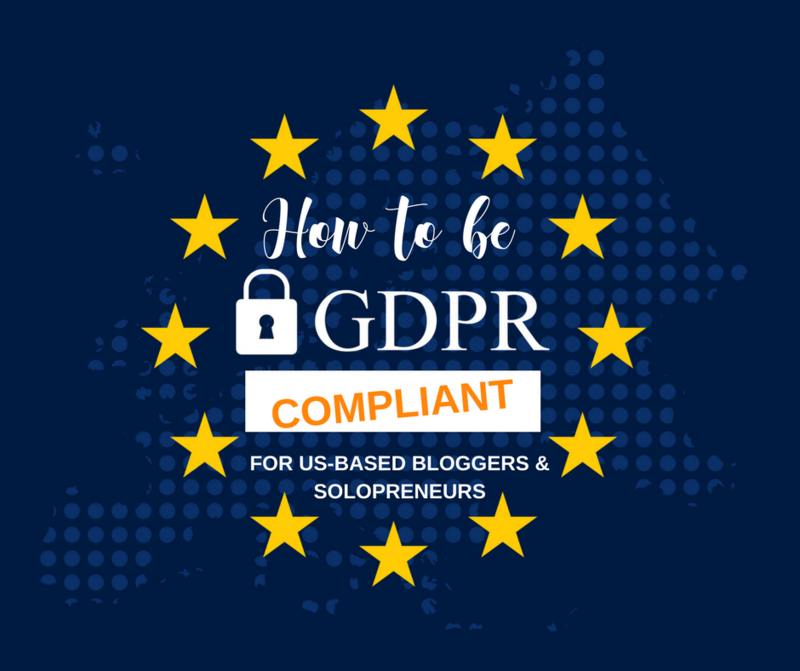 But, if the thought of getting compliant on your own overwhelms you, I'd encourage you to join The Blog Connection or purchase my GDPR Compliant masterclass where I will walk you through step by step what to do to be compliant. Buying the masterclass will give you all you need as a US-based blogger or solopreneur to make your business compliant on your own (though we do strongly suggest you research and consult a legal professional on your own). And in the The Blog Connection, we’ll be delivering the same training to our members as well as keeping you updated as this progresses so you can stay on top of it.